“You told me to wear pink! That tie is lavender!” Don Cherry, the most daring dresser in Canadian television, probably, let alone in hockey, wore pink last Saturday in support of a cure for breast cancer. 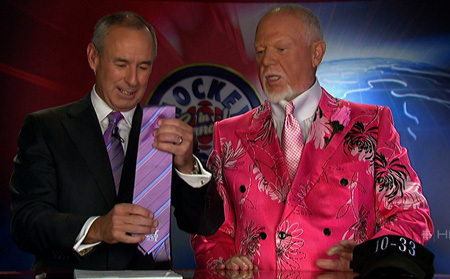 Cherry, the hockey commentator whose fractious half-time show “Coach’s Corner” is a controversial Canadian institution, is here complaining to his drily ironic sidekick Ron MacLean that the NHL’s designated breast cancer tie is not pink, and that it doesn’t really match the properly pink ensemble he’d asked his tailor make for the occasion.